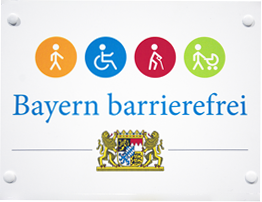 LMU has been awarded the Bayern barrierefrei emblem by the Bavarian government for its efforts to eliminate barriers that impede or discourage the disabled and those who suffer from chronic illnesses from studying at the university. LMU President Bernd Huber was delighted to accept the award: “We have made a great deal of progress over the last few years in providing for barrier-free access to our University. Given the large proportion of historically significant and protected buildings on campus, the achievement of universal access is a very challenging task. But this award strengthens our resolve to drive the project forward,” he said. With a view to accommodating the needs of students with disabilities or chronic illnesses, LMU has in recent years built up the necessary expertise in the areas of counselling services, construction and the provision of technical aids. To cater for the hearing impaired, wireless hearing systems have been installed in 18 large lecture theaters, and 11 smaller lecture halls have been equipped with induction-loop systems that transmit the lecturer’s words directly to students’ hearing aids. Needless to say, LMU’s new buildings all conform to the prevailing standards relating to barrier-free access to public buildings. In fact, the first tactile guidance system at LMU is now in operation in the new BioMedical Center (BMC). Of course, LMU’s Disability Officer is also consulted in the case of less imposing construction and refurbishing projects. In order to enable disabled students to take an active part in smaller classes and discussions, assistive technologies such mobile hearing devices, as well as video magnifiers, camera reading systems, and a notebook with enlarging and screen-reading software combined with a 40-cell Braille display, are available on short-term loan from LMU’s Office for Disability Services. The replacement of steps by ramps and the use of new flooring materials benefits those with sensory impairments and physical disabilities, but also makes getting around campus easier for the elderly and for families with small children. Not only physical barriers, but the more insidious ones in our heads need to be removed. “We want to provide an environment in which everyone can optimally develop their individual talents and contribute fully to society,” says Professor Barbara Conradt, Vice-President for Research and Diversity at LMU. “This year we held our first Diversity Day, which is designed to make people more aware of diversity as such, and of the range of special gifts and needs it encompasses.” In the longer term, one might consider the possibility of alerting teaching staff in advance to the presence of students with particular needs in their classes, so that they can take these needs into account in planning their lectures.